Instiller records every bit of activity for all of the client accounts that are setup with your solution and that helps you to ensure maximum revenue when invoicing your clients. On average, each of our Instiller agencies has around 110 client accounts setup in their solution and that results in having to deal with a lot of data when it comes to sending out invoices. Billing data can be downloaded and we have an API for those pull the information into their systems but with Zapier there’s now a quicker and easier way. If you’re using Instiller and want to save time with generating invoices whilst ensuring that you achieve maximum revenue at the same time then here’s a quick guide that takes you through setting up sending data to Google Sheets each month. The first thing you’ll need to do is setup a Zapier account if you don’t already have one. Their free account is sufficient as that will allow you to run a small number of Zaps each month and there’s more info on the paid plans here. This bit is easy, just click the ‘MAKE A ZAP!’ button at the top of the screen when you’re logged into Zapier. 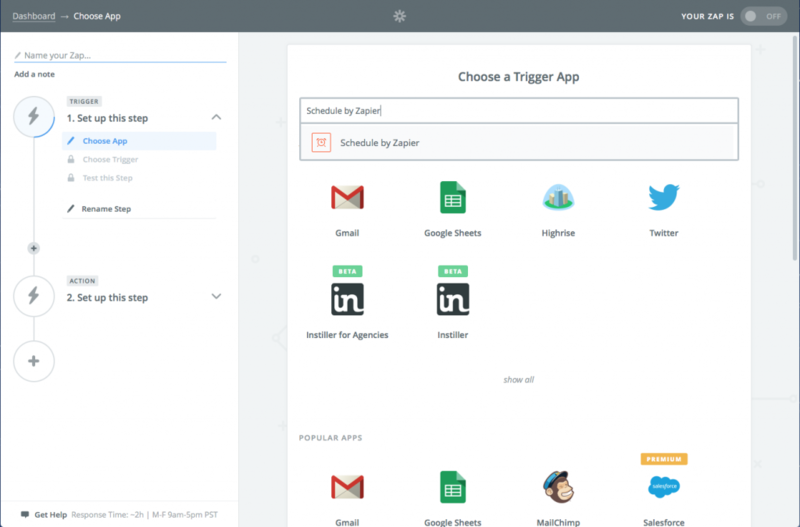 Zapier has a scheduler app that let’s you run timed processes. In the search box type ‘Schedule by Zapier’ and then click on the result. This will fire the scheduler off at 1am in the morning on the 1st day of every month. 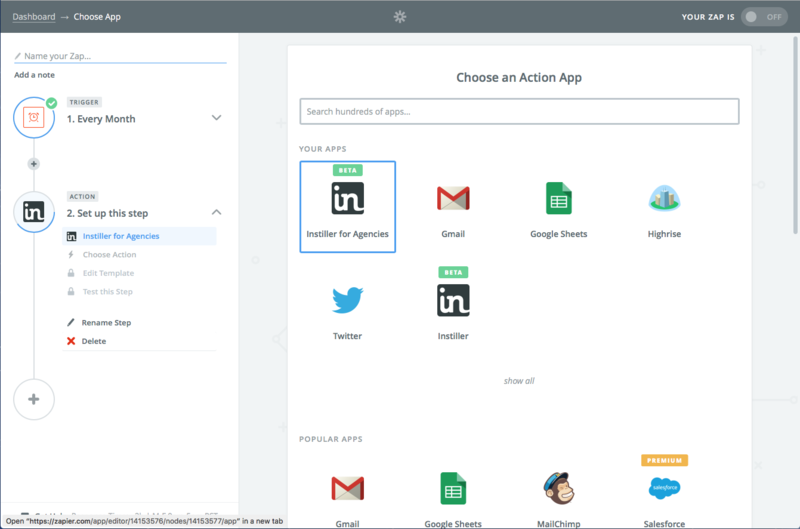 To do this you will have already needed to click on the invite link to add the Instiller for Agencies Zapier app to your dashboard. Type ‘Instiller for Agencies’ in the search box and then click on the result. Press the button until you see ‘Add a Step’ and ‘Finish’ – click ‘Add a Step’. You’ll need to have created a Google Sheets spreadsheet with one row of column headings. For now, just set two column headings of name and transactions. The Action you need to choose is hidden in the next step so click on ‘show less common options’ and then click ‘Create Spreadsheet Row(s)’ – this option will create one row for each of your clients. Click the button to move onto connecting up your Google account and then in the next step choose the spreadsheet and worksheet. To map the data into the correct columns click the button at the end of each input control in the ‘Rows’ section. From the dropdown that appears click on ‘Export Transactions Log’ and then pick out Company Name for the first column and Total for the other. Click the continue button and then on finish to give your Zap a name and to turn it on.